Lost amidst the morass of camp Godzilla insults in the late ’60s and early ’70s, comes this ominous entry in the series, GODZILLA VS. THE SMOG MONSTER (aka GODZILLA VERSUS HEDORAH); a real horror story, which doubles as one long Public Service Announcement against pollution. Japan’s waterways are so choked with sludge, and its smokestacks belching so much poison into the air, that an accretion of this slime gains cognizance and crawls onto the land, toking off the smokestacks and farting its toxic waste on everything pure and clean. Like the first Godzilla movie (1954’s GOJIRA), here is a monster spawned by the irresponsibility of Mankind. And here is the audacious metaphorical twist: Godzilla battles this monster as if he represents Nature – but Godzilla himself is a mutation spawned from the irresponsibility of Mankind! 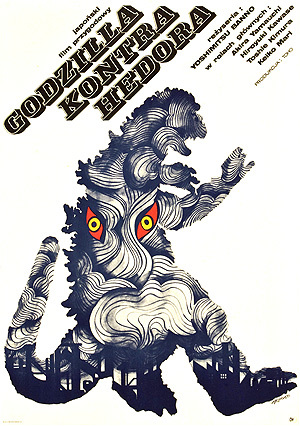 A creative poster for GODZILLA VS. HEDORA: smokestacks at the base of the picture, spewing the eyes of the indefinable Smog Monster onto Godzilla’s silhouette; an artiness that the actual film captures very well. 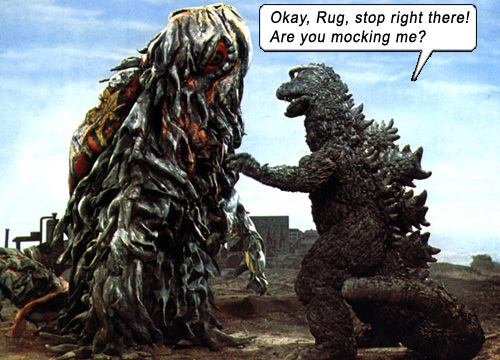 Hedorah the Smog Monster is the Godzilla for the Age of Aquarius. In the 1950s, it was all about nuclear contamination (reflected in the media and horror entertainment of the day, not least because of the real atomic bombs that murdered Hiroshima and Nagasaki and the ensuing fallout that affected Japan for decades afterwards). By the late ’60s, pollution had sludged to the forefront of public consciousness, along with the hippie movement – both front and center in this movie: Hedorah sliming the environment, whilst Japanese hipsters throw their raucous Generic Guitar Solo parties.So with the New Irresponsibility, a new deformed creature is born. And ironically, here comes Godzilla to restore balance as atom heart mother. Opening scenes are eerie, as reports of a “monster” attacking oil tankers are seen on the news. Scientist Dr. Yano (Akira Yamauchi) scubas for answers, leaving his little son Ken onshore (Hiroyuki Kawase). After fending off an attack by a goop blob, which returns to the sea, Ken calls to his father still under the waves. Long past the time his father promised to return, weeping Ken still waits on the shore, wailing at the sea for “Papaaaa…” It is heart-rending. This is not your usual Annoying Godzilla Kid and this is not some throwaway B-movie. It all comes clear with the director/co-writer: Yoshimitsu Banno, assistant director to the legendary Akira Kurosawa (including THRONE OF BLOOD, 1957). No wonder this is so compelling! It would be like Sydney Pollack directing THE FANTASTIC FOUR. Shots of sludge lapping the shore, tracts of garbage and dead fish, even the rock band has that “blobby lava lamp” psychedelia cyclorama. And the Smog Monster reflects this coagulated mess, looking like the shag rug of THE CREEPING TERROR meets THE BLOB, the first really scary opponent Godzilla has ever faced. Dr. Yano’s wife logically asks, “If Hedorah lives off our smoke, wouldn’t that solve our pollution problem?” But Hedorah secretes sulfuric acid, not oxygen like trees; it goes from an aquatic phase to a terrestrial phase, to a flying phase, spraying the skies with acid that turns people into skeletons. Two allusions: 1) acid rain, 2) Gojira met his end in the original 1954 movie by being turned to a skeleton with the “oxygen destroyer”. GODZILLA VS. THE SMOG MONSTER is arty direction and transitions, no desperate camera angles and flailing action; there are cartoons as bumpers between scenes, warning of destroying greenery, factories belching smoke; and the fight scenes are studies in tension. Though Hedorah leaks sludge and oil and flings toxic poo at Godzilla that singes his skin, though there are roars and bodily clashes, most of the fight sequences are strangely quiet, with many shots of Godzilla simply standing still, assessing his opponent, wiping his snout, shuffling. It is oddly disturbing, and almost Bergman, almost Eastwood, almost… Kurosawa. It’s an unabashed message slam, but it’s done very well. Yes, the acting is sometimes iffy, and the reactions of people are sometimes ridiculous; even Godzilla’s motivation to attack this threat to human wellbeing is specious, as if he’s cleansing the planet. (“Godzilla as Man’s Friend” is still ludicrous.) And Ken (in his disturbingly small trousers) eventually becomes the Annoying Kid in the last scene when he runs and waves after Godzilla like SHANE: “Goodbye Gojiraaaaaa!… Gojiraaaaaa!” (Oh, shut up!) But the overall texture of the film layers an insidious terror into our psyches. After all my praise, it’s a damned pity that SMOG MONSTER, one of the best Godzilla films, also contains the ultimate shark jump of any Godzilla movie before or since – Godzilla flies! Writers: Yoshimitsu Banno, Takeshi Kimura. Starring: Akira Yamauchi, Toshie Kimura, Hiroyuki Kawase, Toshio Shiba, Keiko Mari, Yoshio Yoshida. GODZILLA: Haruo Nakajima. HEDORAH: Kenpachiro Satsuma. Version: Japanese, with English subtitles. The Ultimate No.1 WTF Moment in Godzilla Movie History. Accompanied by jaunty military music, Godzilla uses his atomic breath to make a controlled flight longer than the Wright Brothers at Kitty Hawk.